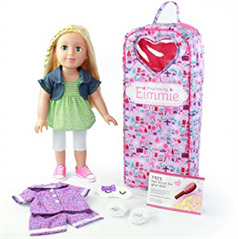 With a Club Eimmie doll subscription, you gain your passport to adventure! 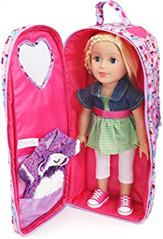 Members receive their choice of Eimmie or her friend with her own carrying backpack and two outfits (one for daytime and sleepwear). 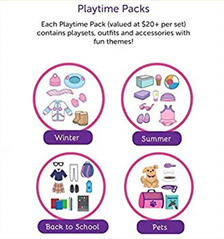 Also included in the one time purchase are Playtime Packs delivered every five weeks ten times for a year. Each Playtime Pack is themed and comes with unique doll playsets, outfits, and accessories that she and Eimmie can play with! Members also gain access to our library of unique printable games and activities sent out monthly for a variety of screen free playtime! Blonde Eimmie or her brunette friend come with their own carrying backpack, two outfits and fun accessories like slippers and an adorable eye mask! Why give the gift of Club Eimmie? Monthly themed collections guarantee kids stay engaged and imaginative. Club Eimmie encourages kids to keep playing with their doll, so it doesn’t get shoved in the back of the closet and forgotten about. Studies have shown that too much screen time can negatively affect a child’s cognitive development. Club Eimmie will help children step away from electronics and entertain themselves with real imaginative play. Scenarios with Eimmie and her monthly adventure accessories empower children to develop their imaginations and curiosity. Play allows children to use their creativity while developing their imagination, dexterity, physical, cognitive, and emotional strength. Kids receive a coloring postcard with each themed box that can be sent to the gift giver as a thank you. A monthly chance to engage in creativity, gratitude and family bonding. 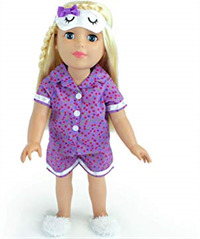 DOLL CLOTHING AND ACCESSORIES: Includes carrying backpack, two outfits (one for daytime and pajamas), slippers, and eye mask. Monthly themed collections guarantee kids stay engaged and imaginative. Club Eimmie encourages kids to keep playing with their doll, so it doesn’t get shoved in the back of the closet and forgotten about. SCREEN FREE ACTIVITIES: Studies have shown that too much screen time can negatively affect a child’s cognitive development. Eimmie will help children step away from electronics and entertain themselves with real imaginative play. PLAY PACKS: Receive a Playtime Pack every five weeks ten times for a year. 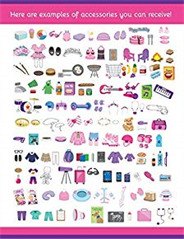 Each Playtime Pack is themed and comes with unique doll playsets, outfits, and accessories that she and Eimmie can play with! 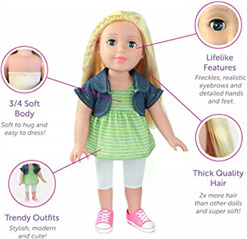 LIFELIKE: Doll features thick quality hair, a ¾” soft body, and detailed facial features. Three Subscription Packages Available: 3 months, 6 months, 12 months. Disclosure: Playtime by Eimmie is not only a gift we truly love, it's a paid sponsor of Savvy Auntie! 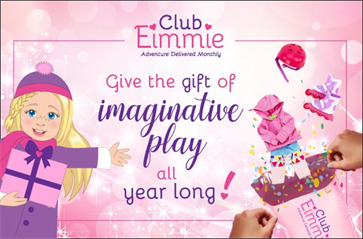 Begin your Playtime by Eimmie "Auntventure" with Club Eimmie! We are always looking for ways to connect and engage with our nieces and nephews when we can't be there. We love Playtime by Eimmie - Club Eimmie - to help do just that. Our nieces want a doll. They want clothing for their doll. They want accessories for their doll. And we want to give it ALL to our nieces. Playtime by Eimmie - Club Eimmie to the rescue! Now, we can give our nieces Eimmie or her brunette friend - followed up with monthly happy surprises in the mail based on the subscription you choose: 3-month, 6-month or 12-month - your niece will receive more clothing and/or accessories with each monthly package of Playtime by Eimmie!